Whereas doubts have been entertained whether troops can be quartered otherwise than in barracks, in case barracks have been provided sufficient for the quartering of all the officers and soldiers within any town, township, city, district, or place within His Majesty’s dominions in North America; and whereas it may frequently happen from the situation of such barracks that, if troops should be quartered therein they would not be stationed where their presence may be necessary and required: be it therefore enacted by the King’s Most Excellent Majesty, by and with the advice and consent of the Lords … and Commons, in this present Parliament assembled… that, in such cases, it shall and may be lawful for the persons who now are, or may be hereafter, authorized by law, in any of the provinces within His Majesty’s dominions in North America, and they are hereby respectively authorized, empowered, and directed, on the requisition of the officer who, for the time being, has the command of His Majesty’s forces in North America, to cause any officers or soldiers in His Majesty’s service to be quartered and billeted in such manner as is now directed by law where no barracks are provided by the colonies. II. And be it further enacted by the authority aforesaid that, if it shall happen at any time that any officers or soldiers in His Majesty’s service shall remain within any of the said colonies without quarters for the space of twenty-four hours after such quarters shall have been demanded, it shall and may be lawful for the governor of the province to order and direct such and so many uninhabited houses, outhouses, barns, or other buildings as he shall think necessary to be taken (making a reasonable allowance for the same) and make fit for the reception of such officers and soldiers, and to put and quarter such officers and soldiers therein for such time as he shall think proper. III. 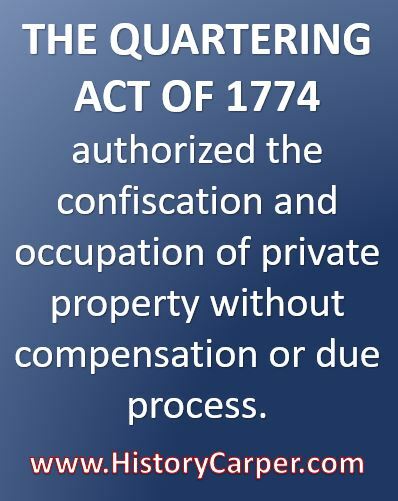 And be it further enacted by the authority aforesaid that this act, and everything herein contained, shall continue and be in force in all His Majesty’s dominions in North America, until March 24, 1776.